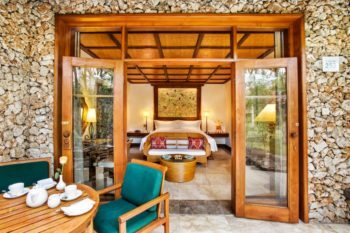 In September 2015 we set out on a six-month journey through Southeast Asia and now, one year later, we’re back again for five months. 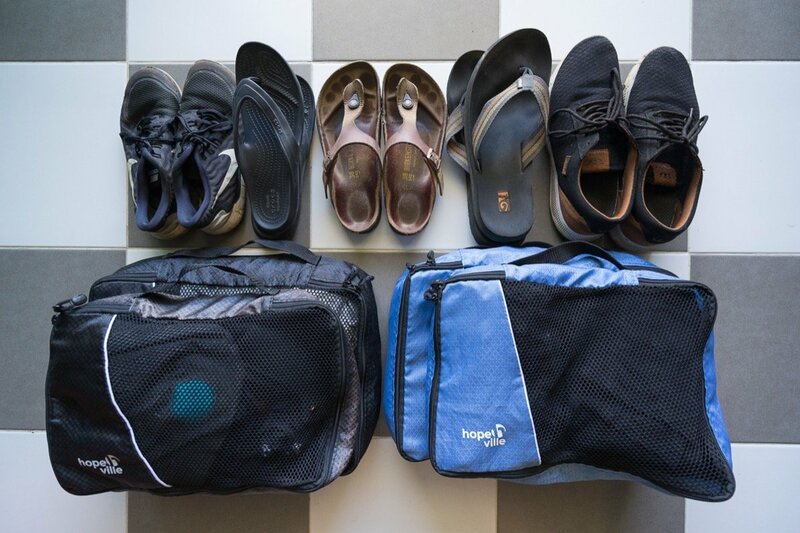 Our list of what to pack for Southeast Asia has changed a bit this year, so we’ve updated the post accordingly. You mustn’t forget to pack anything important. You probably know that feeling, right? The feeling you’ve forgotten something extremely important. 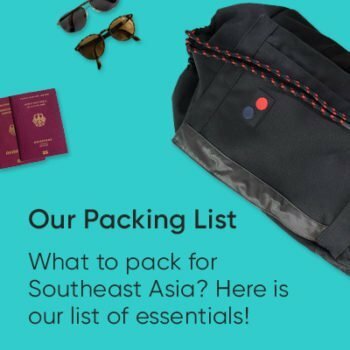 To make sure that doesn’t happen to you anymore, we’ve compiled our very own list of what to pack for Southeast Asia for all you globetrotters, travel photographers, and backpackers out there. The packing list is suitable for both short and long trips. Because you’re going to need exactly the same things whether you’re going for a week or 6 months or a year. We’ve been on the road for over a year now and carry our life on our backs all around the world in just two backpacks. 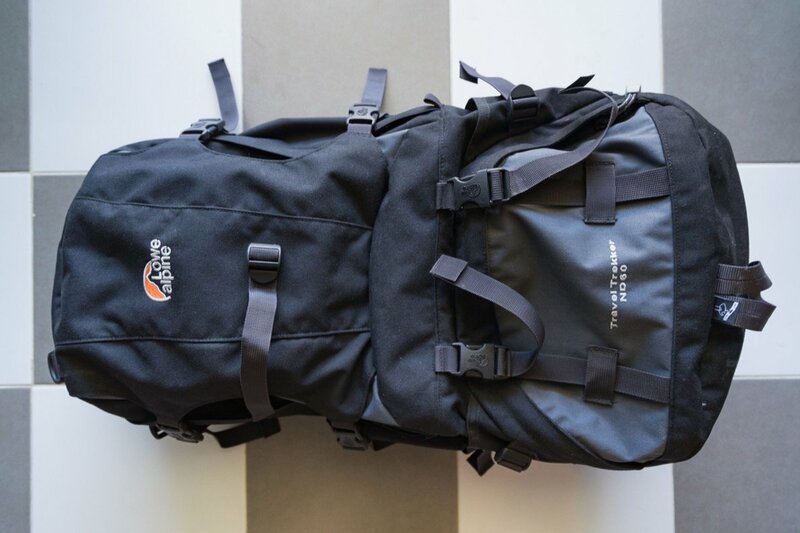 First things first: The first time round, we took two 40-liter hand luggage backpacks, and we’re still convinced that’s the absolutely ideal way to travel. 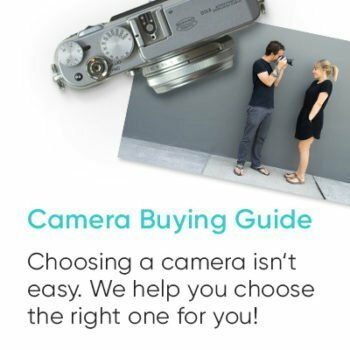 But our travel photography equipment has grown considerably since then, so now two pieces of hand luggage just won’t cut it anymore in terms of weight and size. 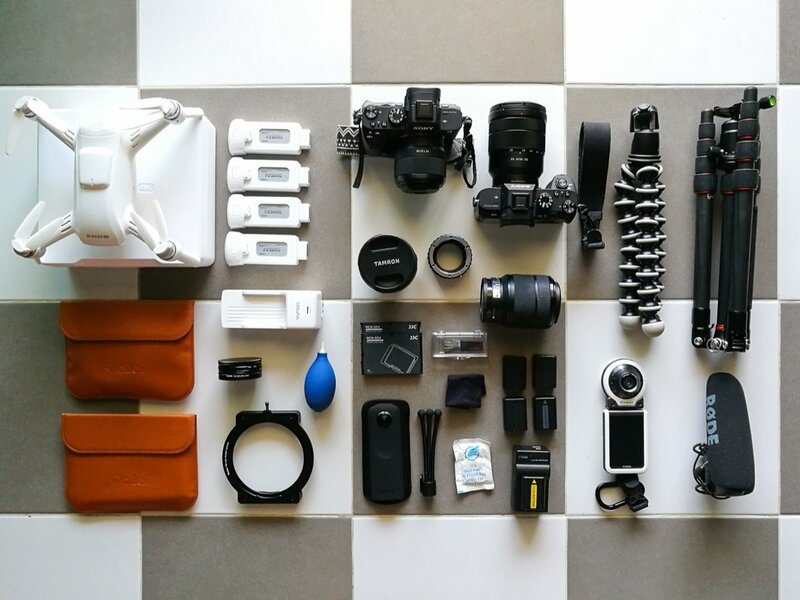 These days we travel with one 40-liter backpack, one 60-liter backpack, and our photo bags. But without all that bulky equipment, our bags would be less than half as full. Even though we’re limited by our tech requirements, we’d still encourage you to consider traveling with hand luggage only. You think going on a 6-month journey with just hand luggage sounds crazy? Don’t worry, you’re not the only one. Our family and friends keep telling us we’re totally insane. Of course we could easily fill two 60-liter backpacks if we wanted. But taking smaller bags forces us to consciously limit ourselves to the essentials and leave behind everything we might pack ‘just in case’ if we had enough space. I’m sure you know the feeling. Contemplating taking an extra pair of shoes or mulling over whether to take a raincoat. Sure, the question “What should I pack?” is bound to be on your mind before a big journey, and the more space you have to spare in your suitcase or backpack, the longer your packing list gets. But the real question is, what do you really need? You usually end up pointlessly schlepping around quite a few quite a few things that aren’t really necessary. So it’s really great when you know you only have limited volume. A month before we left for Thailand, we started making lists of what to pack. A packing list for clothes, a packing list for toiletries & medicine, a packing list for technology, a packing list for our photography equipment, and then there was the packing list we called “safety & miscellaneous”. Writing down everything separately really helped us sort through our things and figure out which of them were really necessary. That way we were able to throw out the typical ‘maybe-I-might-need-that-somewhere-down-the-line’ things and reduce our luggage to the truly essential. And let me tell you, that feels really good. Some things are hard to leave behind, but knowing that it wouldn’t be a problem to buy them in Asia if need be makes it much easier to sort them out. So far, we’ve already used our packing list for Southeast Asia for trips to Thailand, Sri Lanka, Malaysia, Hong Kong, the Philippines, Myanmar, Qatar, and Dubai. We never had the feeling that anything was missing. We’ll tell you what we packed in this post. So, time to bare all and open up our backpacks for you. 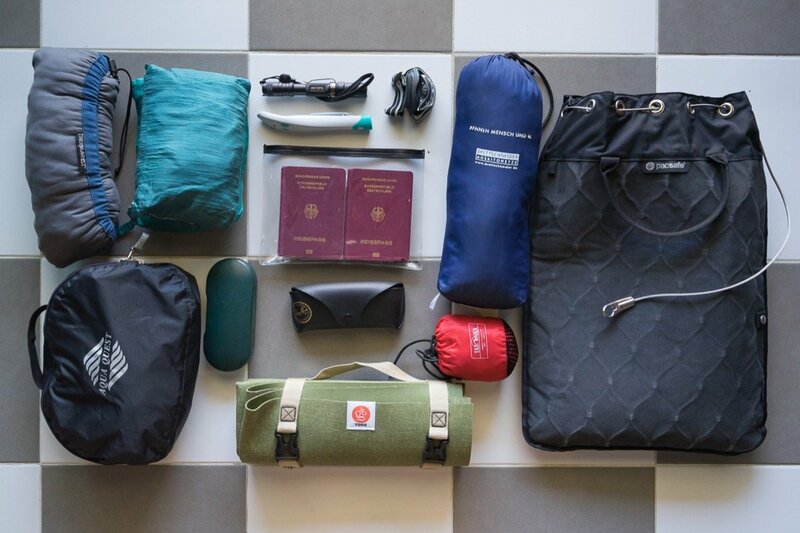 Here’s our packing list for our Southeast Asia trip. 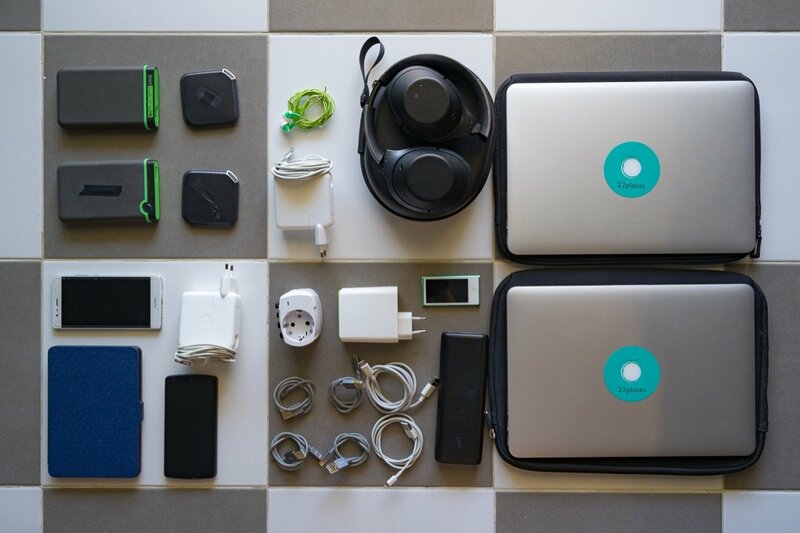 This is what we take when we’re traveling in Southeast Asia. 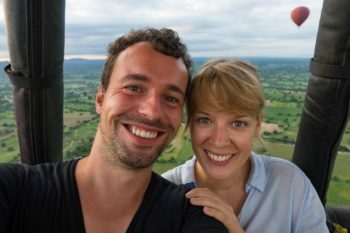 After already having spent last winter in Southeast Asia, we decided to go back again this year. Last year we were still traveling with our favorite hand luggage-sized backpack, the Osprey Farpoint 40. But this year we wanted to bring along some more technical equipment, a small travel drone for instance, so we only took one Osprey Farpoint 40 plus one additional 60-liter backpack. 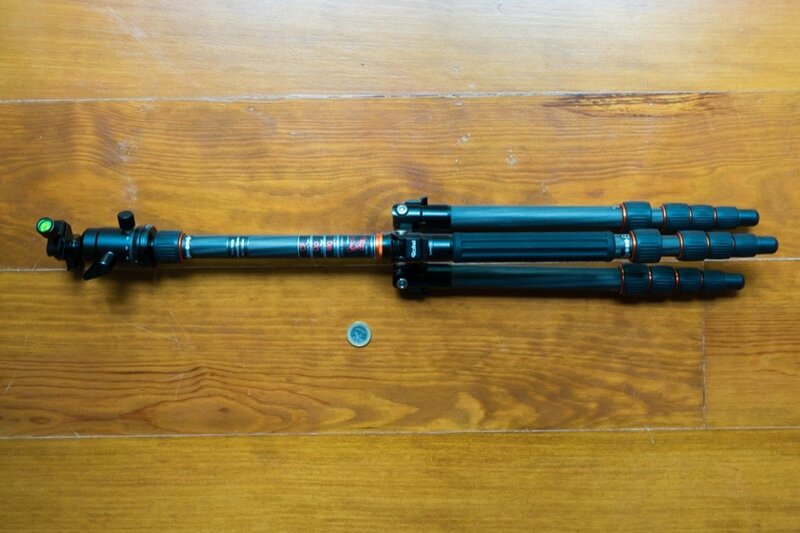 Another reason was the larger tripod we brought this time, which has to be in checked baggage according to official airline regulations. Traveling with a tripod is a bit tricky, and we really didn’t want to have to leave it behind somewhere, so now we have a backpack that needs to be checked when we fly. But since you probably won’t be traveling with quite as much equipment, we wholeheartedly recommend making do with hand luggage. Our two Ospreys would probably be half-empty without all the equipment. We swear by our beloved Osprey backpacks, the Farpoint 40. We have one in blue and one in black. And we’re still currently using one of them for our travels. Our second backpack is the Travel Trekker ND60 by Lowe alpine. 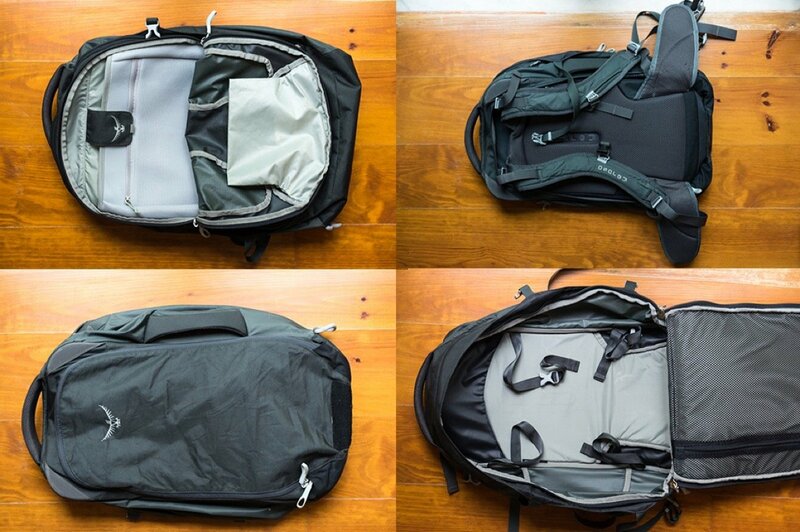 Like the Osprey, the top compartment opens up completely. And there’s lots of room in the bottom compartment too. That’s where we put all the ‘soft’ items like our travel sheets, the mosquito net, the yoga mat, and our shoes. Unfortunately, this backpack is no longer available. But we recommend buying a smaller backpack anyway. If the Farpoint 40 with its 40 liters aren’t enough for you, we have a great alternative. The Farpoint 40 has a big brother, the Farpoint 55. It’s a bit too big for carry-on, but it has the same basic design, just with an extra kangaroo-style day pack attached to the back. We really only decided against it for one reason. We just don’t need a day pack because we always take camera bags wherever we go. 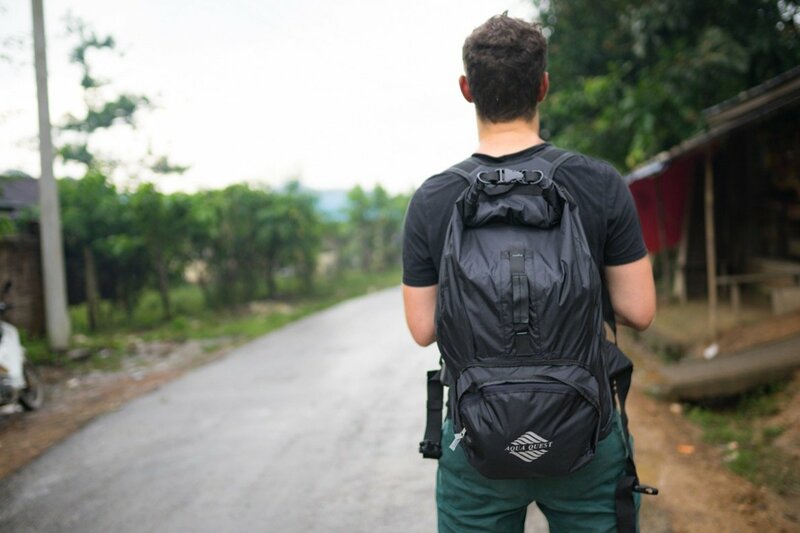 Not everyone loves traveling with a backpack and we actually met a few travelers in Southeast Asia traveling with a wheeled suitcase or a wheeled backpack. If you don’t want to do the whole backpacking thing, then that’s fine too! You can fit 40 liters into the Osprey Farpoint 40. That might not sound like much, but you if you pack smart, it’s more than enough. You can place your laptop in the front compartment, which also has lots more room for other stuff. For example, I put my sweater, my sarong/scarf, socks, and my Sony headphones in there. The rear compartment can be fully opened, which is very convenient and saves us constantly having to rummage around in the backpack. Of course you should never forget to bring your passport. 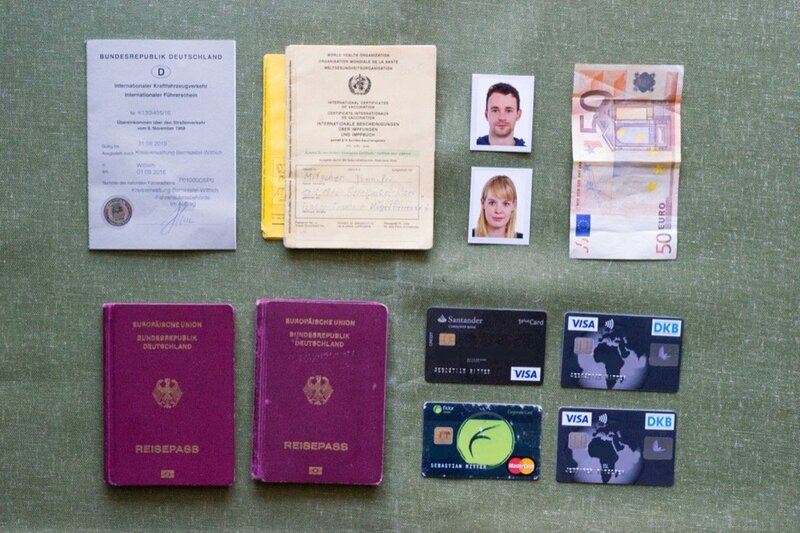 We also always make sure to bring our vaccination records, an international driver’s license and 3 passport photos each for visas or visa extensions (e.g. for Thailand). We also scanned all our important documents and uploaded them to our Google Drive. That way, we don’t have to carry around paper copies, but can always access copies of all our important documents (passport, insurance policy, international health insurance, etc.). This list is very important and even though some of these things take up a bit of space in the backpack, I’m glad we packed them. Most of all, I’m really glad we decided to take the Pacsafe. 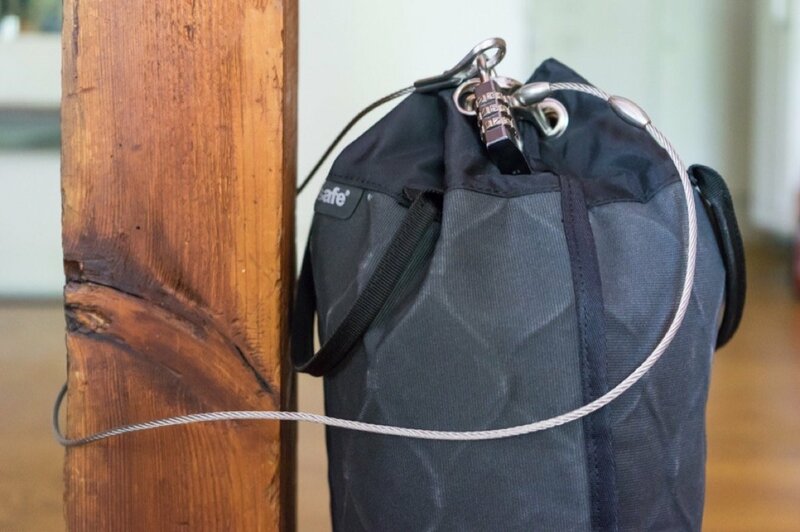 If you haven’t heard of Pacsafe, here’s a short explanation: Pacsafe is a wire-reinforced bag that you can attach to a fixed object using a steel cable and a number lock. Many accommodations don’t provide safes and even if they do, they usually usually aren’t bolted down, making it easy for thieves to just make off with them. We have so much expensive equipment that we’re really glad we don’t have to just leave lying around in the room. The travel safe protects it from petty criminals because it would take them too much time and effort to cut through the wire. An absolute must-have! Our mosquito net has seen a lot of action because even some upper-scale accommodations often don’t provide netting. It’s a good feeling to have a hole-free mosquito net that you can always rely on. We’d definitely recommend taking a box-shaped net because despite what many people claim, you’ll often find yourself staying somewhere without a hook above the bed. Our mosquito net can be attached using four cords on the long sides and three cords on the shorter sides. You effectively only need about 4-6 cords to hang the net. Another advantage of a box-shaped net is that the mosquito net isn’t draped over you at the foot of the bed or one side so it never touches any part of your body while you’re asleep. Because if it does, there’s nothing to stop mosquitoes from biting you right through the net. Therefore, a box-shaped net is the only type we’d consider useful. One factor you have to look out for when buying a net is the mesh size. There are loads of cheap mosquito nets, but most of them aren’t suitable for all Southeast Asian countries because their mesh density isn’t high enough. Product descriptions for mosquito nets either list the mesh size in mm or the number of holes per square inch. Make sure to look out for that. The WHO recommends a mesh density of at least 156 holes per sq in for malaria risk areas and at least 196 holes per sq in for countries with sandflies. Our mosquito net has a mesh density of 1000 holes per sq in. During our research, we read that this might actually be too high for hot countries because such a high mesh density might impede the air circulation in the bedroom. We bought it anyway because the tiny mesh size offers protection against absolutely every type of mosquito: culex mosquitoes (malaria), aedes mosquitoes (dengue fever, yellow fever, chikungunya), sandflies, and even midges. 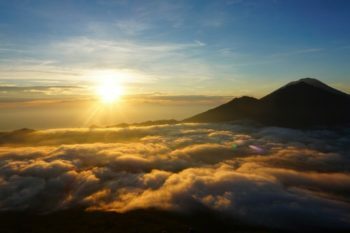 We also saw that there were several positive reviews by travelers who used it in Southeast Asia and they turned out to be right: We had no problems with the air circulation and are very happy with the quality. The mosquito net has very high quality meshing, has proven to be very sturdy, and we use it all the time. It’s easy to hang and quick to stow away in its pouch. Plus it’s very compact and doesn’t take up much space. Another thing that is very important to me is a travel pillow. It took me forever to find the ideal solution! There are some people who can sleep on almost any pillow (take Basti for example), but as much as admire that, I certainly couldn’t. I sleep on my belly, and if you’re the same, I’m sure you can appreciate how difficult it is to sleep on a 30 cm-high pillow. As a makeshift solution, I’ve often had to sleep on my folded sweater, a towel, or something else. Not exactly what you’d call comfortable. So I started searching for a travel pillow, but except for those awful inflatable pillows, there isn’t much to chose from. 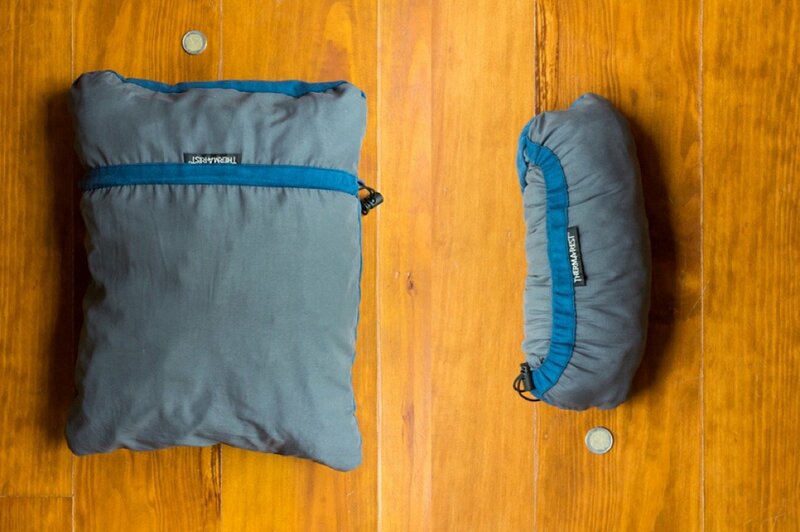 But now I’m happy with my Therm-a-Rest travel pillow: It’s really easy to roll up and it’s super-comfortable. I have the smallest size (S), which is just right for me. Another advantage is that I can simply toss it in the washing machine, and even in the dryer. We’ve also grown very fond of our packing organizers because they really help us keep our backpacks neat and tidy. We often stay in one place for a long time, but other times we’re in a different place every two days and always have to unpack and repack our bags every time. That makes staying organized a real challenge. But the packing organizers make it easy and you can find anything you’re looking for at the drop of a hat. Rain covers for backpacks, waterproof bags, a dry sack, or alternatively a waterproof backpack are an absolute must-have for every Southeast Asia trip in my opinion because sometimes the rain just comes down in buckets all of a sudden and you need to be prepared for that. You should always keep this in mind and keep your valuables and your equipment protected. We both thought long and hard about how to stay fit while on the road. If you travel around a lot, keep moving to a different place every day, and spend all day sightseeing, it might not even be necessary. But we usually try to spend a few weeks at a time in one place so we can concentrate on our work. And then we spend most days in front of our laptops and only really leave the house for lunch and dinner. Hardly a healthy lifestyle! But staying fit is only one of the reasons why we pack a yoga or a fitness mat. If you travel a lot, you need a way to clear your head. For me that’s yoga and the only way to do it properly is if you have a good mat. It wasn’t that easy finding a high-quality yoga mat that’s light enough for travel, but in the end I struck gold. 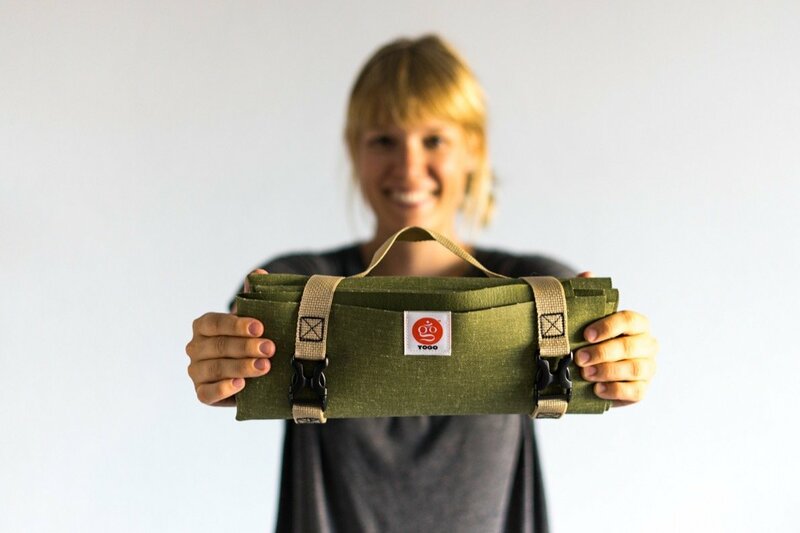 The YOGO yoga mat is originally from California — no surprises there — but now it’s also available in many European countries. You can find more information on the YOGO website. We’ve had to rely on our headlamp and flashlight quite a few times during our travels. On Koh Lanta for example, the path to our accommodation wasn’t really well lit and it was pitch-black at the beach, so without them we would have had to walk back from the beach bar in the dark. In Sri Lanka and the Philippines, power outages are a common nuisance, so we were always grateful for our flashlights there. Another great reason to take a flashlight is so you don’t have to get out from under the mosquito net to turn off the light. Because that’s just the opportunity the mosquitoes have been waiting for. Mosquitoes are annoying and really sneaky. You can apply insect repellent from head to toe and they still find a spot where they bite you several times. In short, they’re total dicks. The small white thing you see on the picture above our passports is our mosquito bite relief. We always take it with us and if you use it right after you get bitten, it works really well! These travel gadgets make traveling easier for us! I don’t go anywhere without my travel pillow anymore. A comfortable pillow is worth its weight in gold. Jenny’s yoga mat. At first, Basti told me I was crazy for carrying around a yoga mat, but now he’s started using it himself for his seven-minute workout. The backpack has been a lifesaver time and time again by saving our tech from dying a watery death. 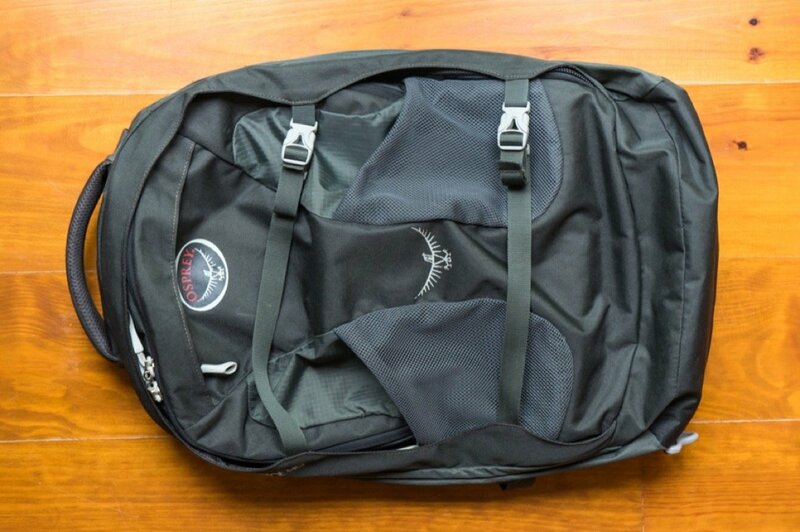 The great thing about the backpack is that it’s super light and you can roll it up and stow it in the small front pouch. Our Pacsafe gives us a sense of security while traveling. 1 TB hard disk — for backups, movies, etc. 2 TB hard disk — for backups, movies, etc. We definitely have more tech and photo equipment with us than clothes. But that’s fine. Because since we have no fixed workplace, we’d be pretty stuck without our devices. My New Sony headphones tune out any noise I don’t want to hear so I can fully focus on what I’m doing, no matter where I am. It’s also a great way to just switch off and drift off into my own world if I need some peace and quiet. Although that peace and quiet comes in the form of music, in my case that’s actually better than complete silence because otherwise I get ringing in my ears. But the great thing about the headphones is their functionality. With the noise-canceling function you can simply tune out all ambient noise completely, and with the ambiance sound function you don’t have to worry about missing important announcements at the airport or train station, for example. And the headphones make another thing a lot easier. That might be a very personal problem, but perhaps you know what I’m talking about: I always wear my headphones while I’m working, but I used to have to take them off whenever Basti wanted to talk to me. With my new Sony headphones, I just have to tap the right earpiece to turn the music volume down so I can hear Basti and my own voice loud and clear. Those might be minor issues, but once you’ve gotten used to it, you’ll never want to go without again! We save all the photos we take on our trips on external hard drives so we have multiple copies. We also keep all our important documents safe on a cloud drive. To help streamline photo editing and cutting our travel videos, we purchased two fast SSD hard drives. The speed burst they provide makes working with Lightroom and Final Cut Pro fun again. Which clothes and shoes do we recommend for your Southeast Asia travels? This is something a lot of people struggle with. We all know the feeling of coming home after a vacation and finding that we didn’t even put on half the clothes we took, much less needed them. Now just imagine having a wardrobe with just enough clothes for 7 days plus a spare outfit. Scary thought? Yeah, perhaps. But it’s also extremely liberating because you no longer have to think about what to wear. And you’ll still always look your best because you’re bound to take your favorite clothes anyway. For example, you really don’t need more than one pair of long thin pants in Asia. Because you only really need them when you’re on a plane or an air-conditioned bus or if you want to go somewhere fancy in the evening. The same goes for a sweater or similar items. You really only need it to survive flights or overland bus trips (where temperatures drop to what feels like 10 degrees Celsius). Another thing that is pretty useful is an extra pair of Thai pants that you can buy anywhere in Southeast Asia for around 3 euros. A tip for all you women: You can also wear leggings or pantyhose with shorts. Also, wherever you go, you can always use a laundry service or wash your own clothes. We’ve actually never had to do our own laundry. In Thailand, for example, we use laundry services where we pay 100 baht (€2.50) for a full machine load or 40 baht (€1) for 1 kg. And you get to your things back dried and folded the same day, or the next day at the latest. So there’s really no reason to pack any excess clothes. Something we really insist on is good footwear. This includes good sturdy but thin shoes and comfortable flip-flops. We’re both incredibly happy with our Teva flip-flops and so far I haven’t found any flip-flops that are easier to walk in. Unfortunately I had to throw out my beloved Teva flip-flops after seven years and the new design just doesn’t seem to fit me properly. So sad! Now I almost exclusively wear my Birkenstocks and carry around a pair of Crocs flip-flops as an alternate. If you’re not as big a fan of flip-flops as I am, I’d recommend packing a pair of comfortable sandals or Birkenstocks. You need to break in your Birkenstocks a bit before they start getting comfortable, but then they’re the most comfortable shoes imaginable. Tip: Birkenstocks tend to be a bit on the large side. I usually have a shoe size somewhere between 38.5 and 39 (or 8/ 8 ½), but I wear size-38 (7 ½) Birkenstocks. When it comes to sturdy footwear, I can recommend Nike Frees. They tend to be a bit smaller than most shoes, so with my shoe size I wear a size 39 (8 ½). Extra tip for Birkenstock: One of our lovely readers wrote in about how much she loves her plastic Birkenstock flip flops, which she says are super-comfortable. We’ll definitely give them a go next time because plastic flip-flops are way more practical for the beach. I think the issue of shoes is really interesting because it isn’t easy finding the perfect footwear for traveling. That’s why I’m keen to know which shoes you travel with. What are your favorite flip-flops? I’m looking forward to your comments. Silicone bottles — for shampoo etc. 30 strength sun cream — usually costs a lot more abroad! Insect repellent — costs much less in Asia. This section of our packing list for Southeast Asia depends a lot on each traveler’s very individual needs. But we still want to give you a few tips. Our main tip: Don’t worry that you might forget something. People in other countries wash their hair and shower too. You can get everything you need locally. One thing’s missing on our list that you may want to think about as a women: tampons. People say that it’s hard to get hold of tampons in some countries or regions. To be honest, I never been searched for them myself because I take the pill and don’t need any. But we look forward to your comment if you know any more about that. Edit: I’ve started consciously looking out for them now and went on the hunt for tampons. Thailand: Especially in the major cities you can find tampons in different sizes. You just need to go shopping in a larger supermarket. But finding tampons on the islands can be a lot harder or even next to impossible. Philippines: The same goes for the Philippines. I found mini-tampons in some of the superstores in Dumaguete and Cebu. But they definitely didn’t have any on the islands. Sri Lanka: Tampons have recently become available in the larger branches of the supermarket chain Foodcity. Myanmar: You can get mini tampons in the supermarket chain “City Mart” in Yangon and Mandalay. But that’s about the only place. Indonesia: I forgot to look for them on Bali, but since I even saw some in mini-marts on Gili Air, I assume they stock them everywhere now. New! Some girls gave me the tip that they use menstrual cups and are very happy with them. I’ve never tried one myself, but after doing a bit of research I think they sound great! Definitely worth a try in any case. Another thing we can wholeheartedly recommend are our silicone bottles. Until recently, we always used those little carry-on-sized plastic bottles you can get in any drugstore for our travels or for the gym. But they always ended up breaking after a few weeks and we needed to buy new ones. So annoying! Before our trip, rather by chance, we stumbled upon these silicone bottles. Such a simple but brilliant invention! The bottles are super-sturdy, they fit quite a lot (80 ml) and you can even stick them to the side of the shower using suction cups. You can buy insect repellent everywhere locally. Most of the time, the local brands are more effective and only cost a fifth of the price. But we still had a bit of Care Plus insect repellent left and so we packed it and it worked just fine. A sonic toothbrush is another important item on our list. If you have one, then you know what I’m talking about when I say that once you go sonic you never go back. But okay, a sonic toothbrush isn’t a total must-have on your list of what to pack, it’s just something we generally recommend. 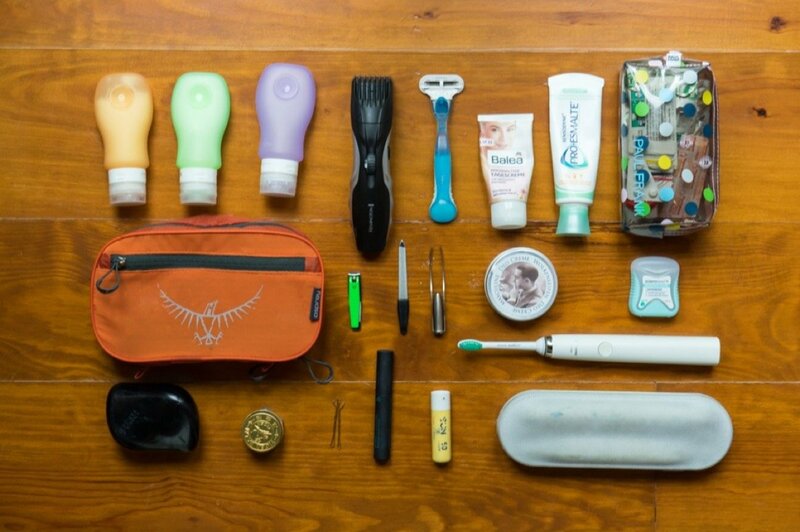 Another absolute recommendation is the toiletry bag by Osprey. We were looking for a very light, smartly designed bag and the one by Osprey was our favorite. It’s almost completely weightless, really well-organized and super-easy to pack. I think we all agree that there are certain things that everyone should put in their travel health kit for Southeast Asia. Your main priority should be items that you might need urgently if the next pharmacy or the nearest doctor is too far away. This includes a pack of malaria standby medication, anti-diarrhea medicine, broad-spectrum antibiotics, and antibiotic ointment (e.g. Fucidine). Everything else is nice to have but not essential. A mosquito bit reliever is especially nice to have. I honestly didn’t think it would work, but we thought what the hell, why not give it a go? And now we’re really happy with our mosquito bite reliever and always have one in our bag. Probiotics are the best cure for diarrhea because they also restore your bowel flora. You should always have some Imodium Multi-Symptom Relief on you just in case, but only take it in absolute emergencies. We use a German brand of probiotics called Perenterol — the active ingredient is Saccharomyces boulardii, which is quite a mouthful and not always easy to find in Asia. Your best option is to just ask the pharmacist for probiotics, that way you’ll get something similarly effective. A roll of medical tape isn’t just a secret weapon against blisters on your feet (in fact we’ve never needed it for that). It’s also great for fixing things, MacGyver-style, or for fitting a T-shirt over the air-con so it can’t blast cold air straight at the bed. Medical tape is also amazing for fixing up holes in a mosquito nets. As far as I’m concerned, it’s an absolute must-have for every travel bag. This obviously depends on where you’re headed, but you can get everything locally in most places, so no need to worry about it too much before you leave. Thai pharmacies in particular are very well stocked. Even the tiniest village in Sri Lanka has a well-stocked pharmacy. The language barrier is the biggest problem. Your best bet is to look up the brand name of the medication in your country and then show the pharmacist the active ingredients. But you should be aware that Thai pharmacies will always try to sell you antibiotics for every little ailment. They’re not subject to prescription there. If that isn’t something you want, you should tell the pharmacist and look up alternatives online on your phone. The one thing you absolutely need is an international health insurance to cover your medical costs in the event of an emergency. We’ve already written some more about that in the section on documents. Novoflex adapter — to use our Tamron lenses (for Nikon cameras) with our Sony. We both made the switch to Sony and take pictures with the Sony Alpha 7ii and the Sony Alpha 6000. We only brought two Sony Alpha 7ii’s to Asia this time and left our Sony Alpha 6000 back in Germany. But that’s simply for work-related reasons. We’re still huge fans of the Sony Alpha 6000 and highly recommend it: not just for for traveling, but for general everyday use. Of course, we also always take our Tamron travel zoom that we connect to the Sony camera via a Novoflex adapter. Unfortunately, there’s no direct E-mount connection so we take photos with the travel zoom using manual focus and set the aperture on the adapter and not on the camera. But with focus peaking that works just fine and is actually a lot of fun! Our general rule is “less is more”. Except for a few smaller things, your passport and your travel credit cards for example, you can get everything locally. You can buy clothes anywhere in the world and I promise you that clothes for one week are more than enough. Now have fun packing and even more fun traveling! 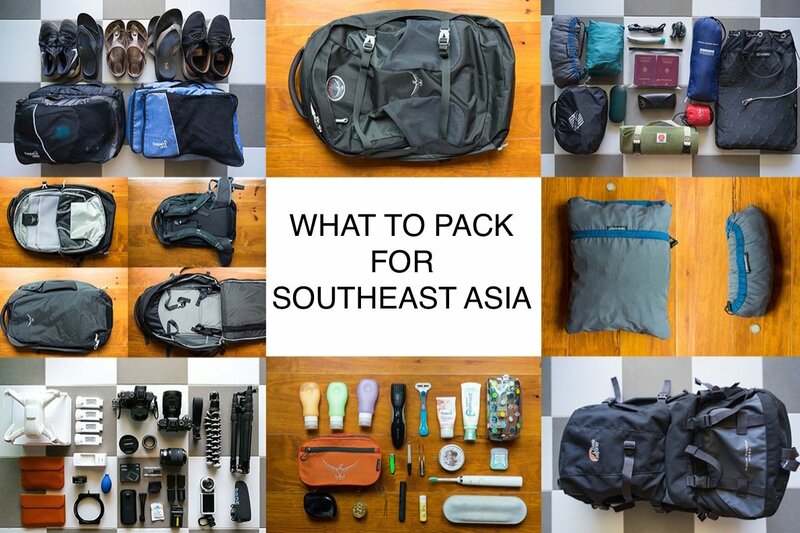 Do you have any questions about our list of what to pack for Southeast Asia? What are your experiences? Do you have any questions that we may be able to answer? We look forward to your comments on our packing list! Yay, I’m glad it’s helpful! I have had the same rolling carry-on for a decade in large part because I only use it for domestic trips. Love my packs, prefer lightweight clothes with a power bank and some dry fruits hehe thanks for the article very much informative. keep up.